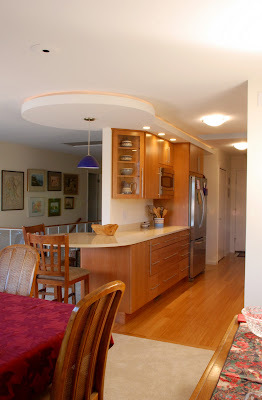 Our clients for this project wanted to transform their cramped kitchen into a space that would be as comfortable for two people as it would be for twenty. Our design build solution achieves this goal by demolishing two small walls to create a more open space. Views through the kitchen and to the outside add to the feeling of openness. A new cabinet layout provides more storage and abundant counter seating. See more here.